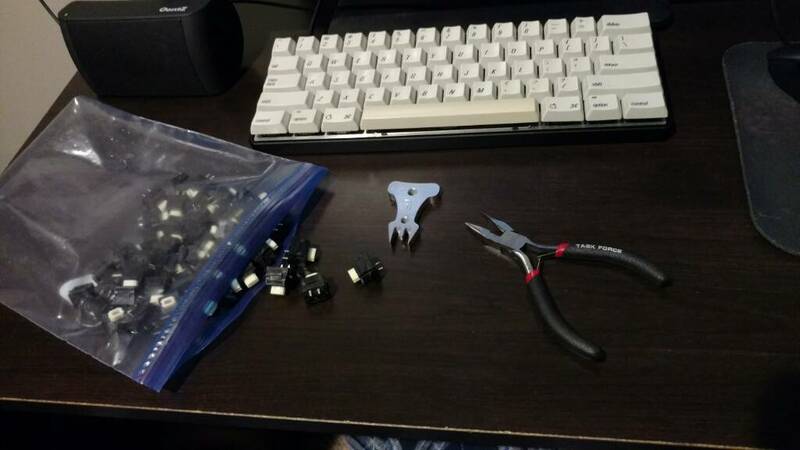 Did you know you can modify a tactile Alps switch to make it clicky in just a few very simple steps? This modification is a great way to breathe new life into some of our less well-loved switches (I'm looking at you, cream damped Alps! ), or to get the clicky Alps keyboard you've always wanted without paying today's ridiculous prices for blue Alps switches. A handful of click-modded, cream dampened Alps from an AEKII. These ain't your father's cream damped Alps. So let's take a look at how to click-mod tactile Alps! I first learned about click-modding in the Alps Appreciation Thread a while back. It's a pretty simple modification: just take a tactile Alps switch, open it up and bend down some metal tabs on the tactile leaf. It's so simple, in fact, that I actually had a hard time wrapping my mind around how it works. Notice how the click-modified leaf pulls away from the wall of the switch housing as the slider is pushed down. Then as the slider gets past the bump, it rapidly forces the leaf back to its original position, slapping it against the switch housing resulting in an audible click. In our cutaway switch the slot wall on the near side has been removed, but the far side slot wall is doing a good enough job holding the leaf against the outer housing wall. But once you bend those tabs back, there's nothing to hold the leaf against that slot wall. And so that's how you make a tactile leaf clicky. It's worth noting that when the leaf pulls away from the outer housing wall, it also changes the angle of the leaf's bump, thereby affecting the tactile feel of the switch and decreasing the necessary actuation force. This is why a click-modded cream Alps, which is normally a very stiff switch, ends up feeling a lot more like a clicky blue Alps. I hope this was helpful to some of you who are interested in this mod. It certainly helped me understand my Alps switches, and it gave me a much deeper appreciation for the engineering behind them. I'm thoroughly impressed with the elegance of the design. The tactile/click leaf is completely separate from the electro-mechanical components, allowing for a single switch design to support click, tactile and linear action by simply changing or removing a tiny piece of bent metal. 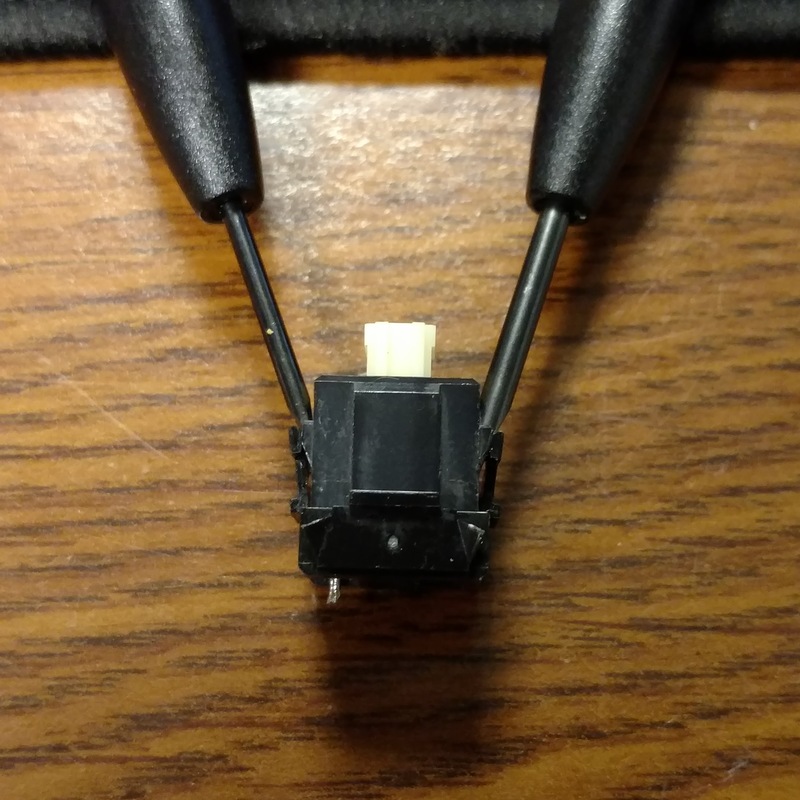 Compare this to Cherry MX switches, which require significant changes to the internals. I had some left over photos, so I'll post them here in the hopes that they're helpful for new modders. Those are teeny tiny slotted screwdrivers. I use one on each side and pry them up. Make sure the round corner goes against the switch plate, and the sharp corner against the tactile/click leaf. Otherwise your switch will feel wonky. Cool thanks for sharing this! I was curious how it was done. I kept thinking people were swapping leafs between switches. One of the best things that I see here is that the actuation force is decreased - to me that sounds like a click-modded orange has the potential to be even better than a blue. Two switches, actually. The first one didn't survive. Fortunately I have extras. I'm curious, what kind of lube do you plan to use? I've had bad results with Krytox grease. Lots of folks talk about dry lube for Alps but nobody seems to know what kind is best. Now I can see why you were so curious whether it's worth it. That would involve opening twice as many switches, and potentially losing half of them. As it happens, you often have to open Alps to clean them anyway. This is just one extra step before reassembly. And it's hard to screw it up! The click modded oranges have a stiffer bump, which makes them feel heavier even though they have a lighter spring. Not a bad feel, but I like stock oranges well enough not to bother click modding them. Creams, on the other hand, are in need of serious rehabilitation. I think PTFE is just Teflon so you should be safe. Applying it to little parts with a spray can might be a pain though. Have you tried bending all four tabs? It seemed a little bit clickyer, but maybe thats because I only tested with two different switches. I did not try this because it looks like the bottom tabs hold the leaf at the bottom, acting as the pivot point. Seems like bending those down might affect the reliability of the action. Besides, stock click leaves have the bottom tabs, so I figured the Alps engineers know what they're doing. Nice writeup, and thanks for the detailed explanation! I used some dry lube with PTFE(Teflon), that did NOT have silicon, and it seemed to not have any noticeable effects. I'm wondering if the silicon lubes make a difference. One suggestion. At the head of the OP, how about prefacing the details with a short explanation of why someone would want to perform click modding. I was reading the article thinking this is an interesting explanation, but I'm not sure where we are headed. It wasn't until 3/4 of the way through that I deduced the purpose. This is good feedback. I've updated the OP as per your suggestion. I just tried lubing the clicky oranges with the rz50, and it seems to feel smoother. Maybe because they were dirty and the lube helped smooth it out? Main difference was the initial ramp up seemed to have been reduced - a bit easier/smoother through the bump. Also noticed while experimenting was that you can see the clicky leaf action if you just reassemble the switch with the top casing off. To see the tactile action then use something like a pair of tweezers to hold the leaf in place. You really only want to lube the sides of the slider where it rubs along the top housing, and possibly the bottom front and back edges where it rubs against the two metal leaves. “Almost the entire slider” is somewhat exaggerated. I haven't started on this yet, but if this lube sprays on and dries, would it not be easiest to lay them all out on a sheet, spray one side and let it dry, then turn them all over and do the other side? A tiny paint brush and 100+ switches seems like a lot of effort. Also, if you squirt the spray out into a small bowl then paint it on, isn't there a chance of the liquids separating and settling? I don't see what would be wrong with turning all the sliders upside down and spraying them en masse. You would get some dry lube powder in the spring pocket, but I don't know if that would hurt anything. I think this would be the easiest way. I took and sprayed each slider individually, so it took a little longer. I'm not sure you could spray it into a a bowl and then brush it since, as advertised, it dries almost instantaneously, so it would probably dry up before it can be brushed on. Why would the inside be a problem as long as it stayed there and did not settle to the bottom? Numerous mods specifically focus on lubing the springs. Awesome guide; was much easier than I anticipated! Will be using this for my clueboard build with orange alps! That's true, it shouldn't be a problem even if it got on the inside of the slider. My initial goal was just to lube the outside of the slider where it touches the rails, leaf and backplate, and try not to overspray. I'd love to see a side by side comparison of these and blue Alps. How do the click plates compare? How do the spring weights compare? They should feel very similar. They are pretty similar, weight-wise, with blues maybe just slightly heavier. 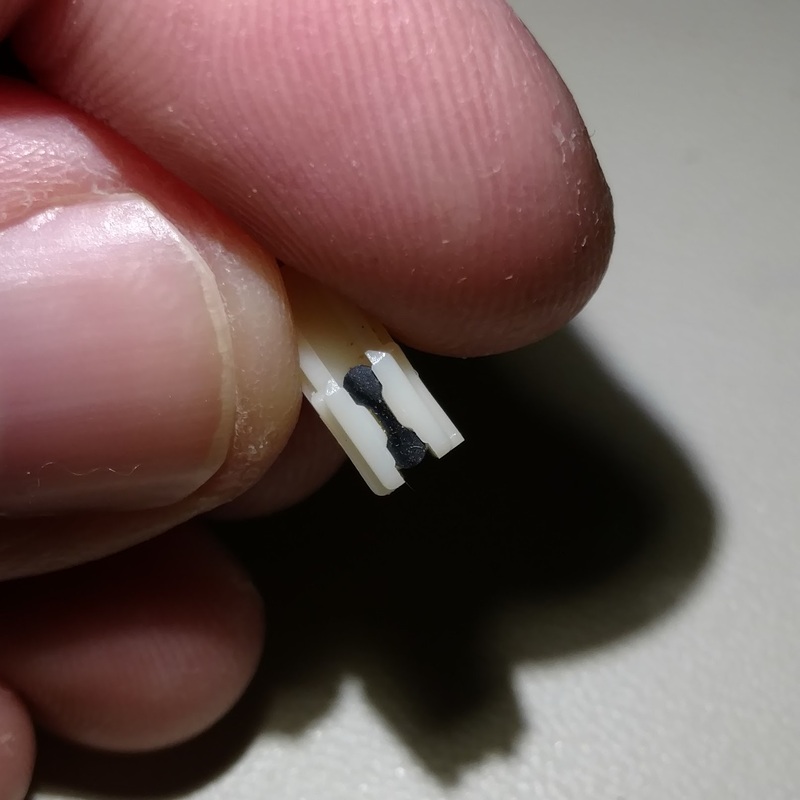 The biggest difference between the click leaf is that clicky Alps have a little pill-shaped protrusion stamped onto the back side, which acts as a "hammer" against the housing wall. Honestly, though, it doesn't seem to have that big of an impact on the sound or feel of the switch. Going lubeless for now, but i'm liking how they feel. 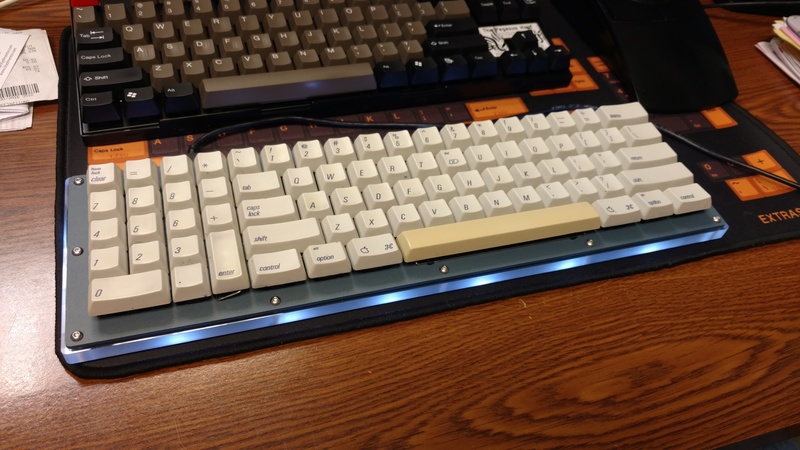 Are you modding cream damped Alps from the donor AEKII? That's my plan for my next Alps build. I desoldered an AEKii and have been modding the switches when im not casting caps. I took a dremel to the plate from the aek and mad it fit into a poker case. I finished building my Monarch tonight, which means this is my first chance to try out my click-modded Alps on a real keyboard. I apologize for the dirty keycaps; they're all I have available until the corrected Alpine Winter order arrives. All in all, I'm pretty happy with the feel of these click-modded switches. I had to open them up to clean them anyway, and with the help of mrbishop's handy Alps opener tool, it went pretty quickly. I picked away at a bagful of switches while watching Psych on Netflix. It took me about two-and-a-half episodes to get through the bag. I'll just come out and say this--click-modded cream Alps are not blue Alps. 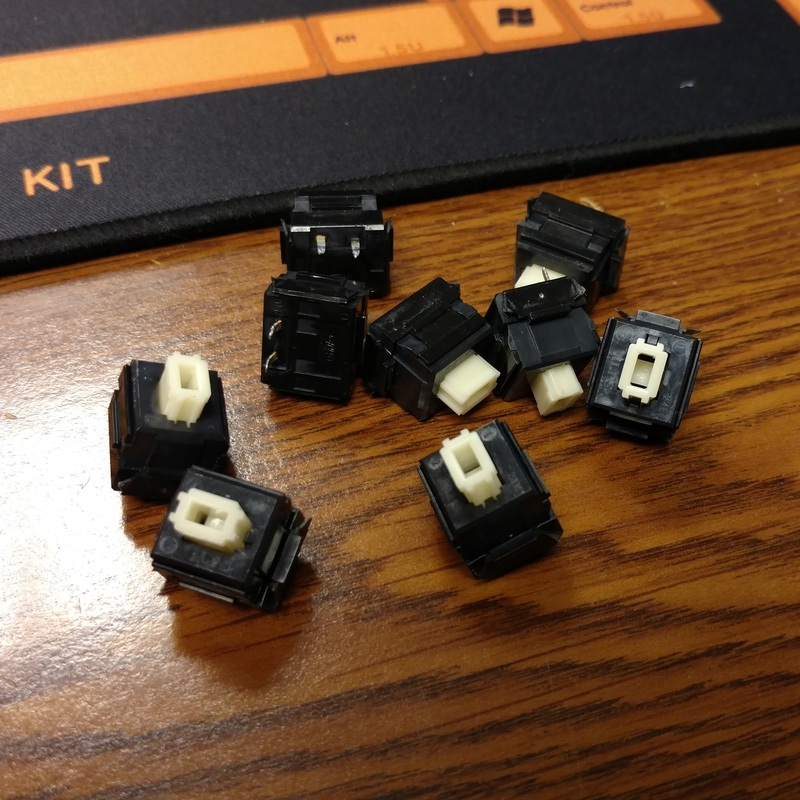 But they are better than white Alps and, IMO, a worthy alternative to throwing out what I would consider otherwise worthless cream Alps switches. I absolutely do not regret using them on a pricey custom kit such as the Monarch. I guess I'm looking for an unclick mod - sorry for the necro! 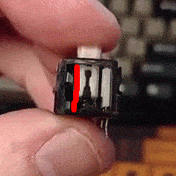 Wondering on how to remove the click on my Orange alps. On the upswing after being depressed, some of them click for whatever reason (I suspect something is wrong with the leaf) - does anyone know what I can do to remedy this? My first guess would be they are just dirty. Any way to get some pics of a faulty leaf and housing? They are ultrasonic cleaned and ro59 lubed, so they're definitely not dirty. I tried putting a small square of paper between the back of the leaf and top housing, and it seems to do the trick. Still wanna follow up with your proposed solution though. hmm... most of my orange alps do that. I figured it was just the nature of the switch. It's not a full click or anything, just a slight click. Page created in 0.105 seconds with 55 queries.